MMMay17 mid way round up! Day 1 - Fall Turtleneck and vintage-pattern hacked trousers; Day 2 - Named Clothing Kielo Wrap Dress over a sleeveless Rise Turtleneck; Day 3 - GBSB pencil skirt hack and Simple Sew Lottie Blouse; Day 4 - Named Clothing Inari Tee Dress layered over a Fall Turtleneck; Day 5 - Vintage-pattern trousers, Rise Turtleneck and Grainline Studio Driftless Cardigan; Day 6 - Sew DIY Nita Wrap Skirt, Rise Turtleneck, Papercut Patterns Waver Jacket, Radiant Home Studio Retro Rucksack; Day 7 - Sew DIY Nita Wrap Skirt and Fall Turtleneck. 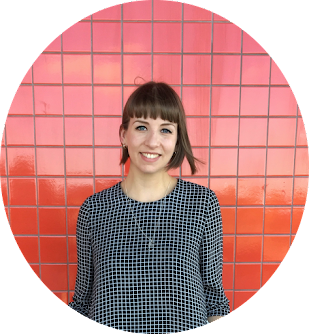 I very quickly realised my obsession and reliance on my (luckily) fairly large collection of Papercut Patterns Rise/Fall Turtlenecks. I wore one in some form or another for 6 out of 7 days in week 1 and 4 days in week 2 and it's opened my eyes to a near-imminent need to make some other style of top/t-shirt - something lighter weight and more suitable for warmer weather. Recommendations of simple-yet-quirky basics would be very much welcomed if you have any! It felt almost boring and uniform-like to keep reaching for this same style of top in the first week, but I think that's more of an effect of being hyper-aware/photo taking each day. It's clearly a pattern I love and a style I'm comfortable with wearing in lots of different ways and situations, so I'm not going to fix what's not broken, just maybe add a couple of non-turtleneck casual shirts into the mix to compliment! 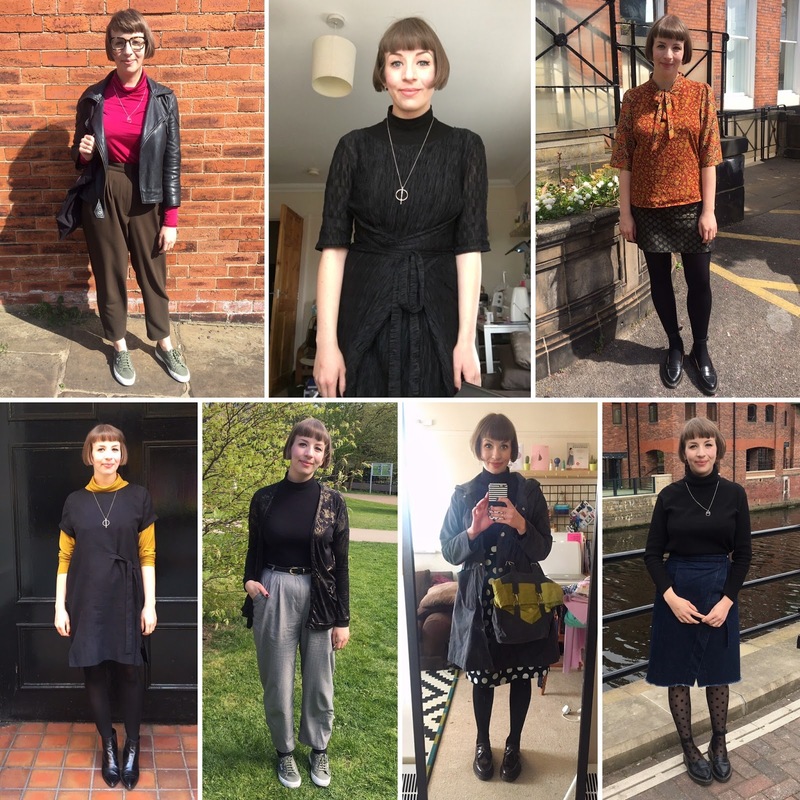 Day 8 - Pinstripe B6178 culottes and Fall Turtleneck; Day 9 - V9186 dress; Day 10 - Vintage pattern-hacked trousers, sleeveless Rise Turtleneck and Grainline Studio Driftless Cardigan; Day 11- Ready to Sew Jane Shirt and B6178 culottes; Day 12 - Rise Turtleneck and Pauline Alice Turia Dugaree Dress; Day 13 - Rise Turtleneck and Named Clothing Kielo Wrap Dress; Day 14 - No Patterns Needed Deep V Tunic and B6178 culottes. 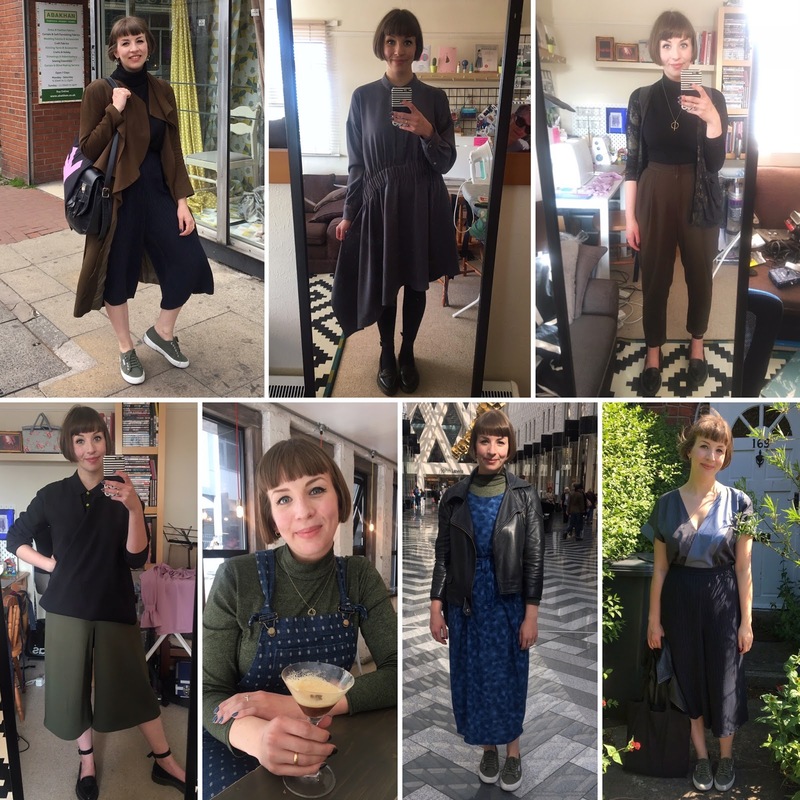 Week 2 has clearly been themed around blue and khaki, and the amount of colour I've been wearing has actually come as a bit of a surprise to me - I really thought I wore more black! Picking my clothes each morning has really highlighted my tendency to reach for the newest things I've made, so I've consciously tried to dig a little deeper into my wardrobe and mix things up a bit. I'm quite pleased with how I'm doing so far, but there's still quite a lot of my wardrobe that's gone untouched. The real challenge for the next couple of weeks will be seeing whether I can get some older makes into rotation or working out if it's time to part ways with them. RIP Kielo: day 13 of MMMay17 and the first wear! 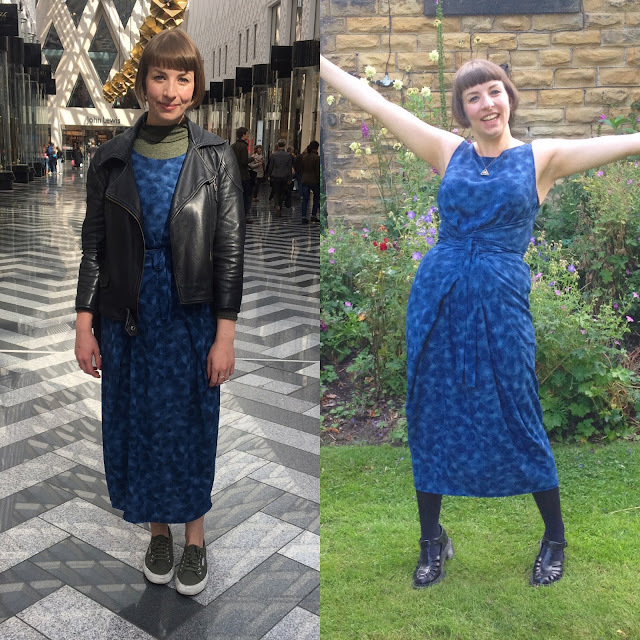 Finally, a special mention needs to go out to my long time favourite dress, which is very sadly on it's way out after many wears and multiple repairs. This Kielo Wrap Dress was my first Named Clothing pattern and probably one of the first things I made that I truly felt was 'me' in style. I'll be sad to see it retired/repurposed/recycled, but on the plus side, at least I have the right hobby for making a replacement! Such a fab collection of me-made garments here. Its great that you have a pattern and style that works so well for you - I have about 8 Scout tees that I love. Fabulous! I really love your style. That Inari tee dress with the side tie is just genius!